Classic British stamps took pride of place in the December stamp auction. 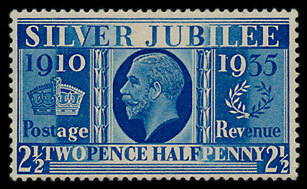 The 1935 Silver Jubilee 2½d in Prussian Blue colour has become an iconic stamp for collectors. A rarely seen example was included in the auction, it came with an expertising certificate and reached £5,900. Amongst the Queen Victoria lots an 1862-4 1/- green with watermark error (3 roses & thistle) sold for £2,120, a mint 1867-83 £5 orange made £5,300 & an 1891 £1 green sold for £1,150. The ‘Kings’ lots were equally popular. A King Edward VII £1 sold for £366 & a 1913 Seahorse £1 achieved £1,120. In the British Commonwealth section a range of Cayman Is lots sold very well (you can read more about these lots here). 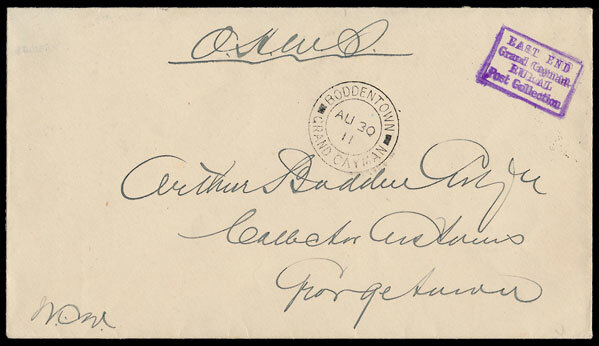 The most eye catching item, a Rural Post unstamped cover, reached £740. The Foreign section of the auction included a very unusual 1911 envelope sent from Tibet to Peking using a colour combination of 7 stamps. The cover was offered at £300 but was eventually knocked down for £3,300.